Eating beef products, which are loaded with artery-clogging cholesterol and saturated fat, is a good way to increase both your waistline and your chances of developing impotence and diseases such as heart disease, diabetes, arthritis, osteoporosis, Alzheimer's disease, and asthma. Research has shown that vegetarians are 50 percent less likely to develop heart disease than are meat-eaters, and they have 40 percent of the cancer rate of meat-eaters. Plus, meat-eaters are nine times more likely to be obese than vegans are. Every time you eat animal-derived products, you're also ingesting bacteria, antibiotics, dioxins, hormones, and a host of other substances, some toxic, that can accumulate in your body and remain there for years. Learn more about how consuming animal products affects your health. Cows are gentle, social animals. Each cow has the ability to recognize more than 100 other cows, and they form close friendships with members of their herd. Researchers report that cows grieve when their friends or family members die. Learn more about cows' personalities and some of their amazing feats. Clint Eastwood recently said, "I try to stick to a vegan diet - heavy on fruit, vegetables, tofu, and other soy products." Howard Lyman was a fourth-generation cattle rancher who became vegan after learning about the effects of factory farming - he now tours the country promoting a vegetarian diet. Other tough guys who refuse to eat animals include hip-hop legends Andre 3000 and Mos Def, actors Tobey Maguire and Joaquin Phoenix, NFL superstar Ricky Williams, and Olympian Carl Lewis. To make cows grow at an unnaturally fast rate, the cattle industry implants them with pellets full of hormones. While low levels of naturally occurring hormones are found in various foods, many scientists are concerned that the artificial hormones injected into cows cause health problems in people who eat them. The Los Angeles Times reports that confidential industry reports have found extremely high levels of estradiol, "a potent cancer-causing and gene-damaging estrogen" in meat products from cows treated with the hormone. According to the Times, "[T]he amount of estradiol in two hamburgers eaten in one day by an 8-year-old boy could increase his total hormone levels by as much as 10%...." Learn more about meat and hormones. Cattle are subjected to abuses that would warrant felony cruelty-to-animals charges if they were committed against dogs or cats. Cows have their horns sliced off; they are branded, which causes excruciating third-degree burns; and males are castrated. This is all done without any painkillers. They are injected full of hormones and confined to overcrowded, dusty feedlots for months. Then they are shipped without food or water to the slaughterhouse, where a metal rod is shot through their brains and they are hung upside-down and have their throats slit. Because line speeds are so fast, many of the animals are still conscious throughout the process. Learn more about cows in factory farms and slaughterhouses. It is inefficient to grow grains and other feed crops for animals - only a fraction of what we feed them is actually turned into flesh that humans can eat. The vast majority is used by the animal to live and grow. The highly respected Worldwatch Institute says, "In a world where an estimated one in every six people goes hungry each day, the politics of meat consumption are increasingly heated, since meat production is an inefficient use of grain - the grain is used more efficiently when consumed directly by humans. Continued growth in meat output is dependent on feeding grain to animals, creating competition for grain between affluent meat-eaters and the world’s poor." Learn how you can help fight world hunger by going vegetarian. Millions of cows are killed in slaughterhouses each year in the United States. The few who manage to escape pull off some amazing feats. A cow named Emily got away from a Massachusetts slaughterhouse, leapt over a 5-foot gate, and survived for several weeks in the woods during the New England winter before she was rescued. A pregnant cow named Suzie was being loaded onto a freighter when she ran back down the gangplank, leapt into the river, and swam across. She eluded capture before being rescued by PETA and taken to a sanctuary. And Molly, a cow from Montana, recently escaped, crossing the Missouri River before finally being caught. While all three of these cows touched their communities' hearts so much that they were released to sanctuaries, the millions of nameless cows killed by the meat industry each year aren't so lucky. Factory farms and feedlots produce a staggering amount of feces that pollutes both the water and the air. Stored in massive lagoons, the manure seeps into nearby rivers and streams, killing fish and ruining the quality of the water. The feces also emit harmful chemicals and microorganisms into the air. Numerous studies and governmental reports have shown higher rates of miscarriages, respiratory problems, and neurological diseases among people who live near factory farms. Learn more about how factory farms are harming rural America. Mad cow disease is already in the United States, and the U.S. government is not following World Health Organization recommendations for ensuring that it doesn't spread. While Japan and all Europe countries have banned the feeding of animal protein to farmed animals, the practice continues across the board in the U.S. meat industry, which is just begging for a "mad chicken," a "mad pig," or some other variant of the disease in the U.S. meat supply. Because it takes years for the disease to show up in humans, there's no way of knowing how many Americans have already been infected. Amazingly, the U.S. government still refuses to take the problem seriously. 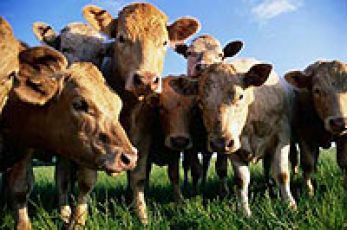 In 2005, the U.S. Department of Agriculture (USDA) tested less than 1 percent of U.S. cows for the disease. Unbelievably, even though the third case of mad cow disease in the United States was found in 2006, the USDA announced that it is scaling back this testing. Leaving cows and other animals off your plate is easier than ever. You can now get tasty veggie burgers at numerous restaurants, including Burger King, Johnny Rockets, and Ruby Tuesday. Check out our favorite beef substitutes, all of which are delicious and cholesterol- and cruelty-free.